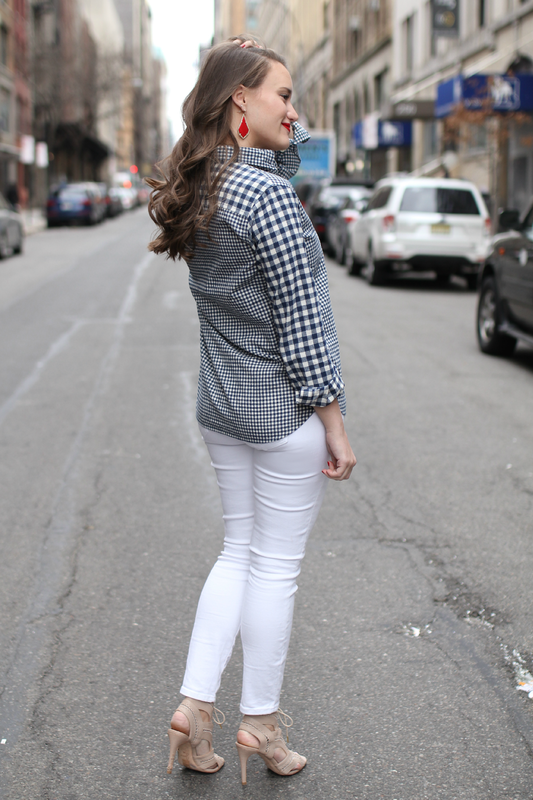 More white pants!! Woooo. 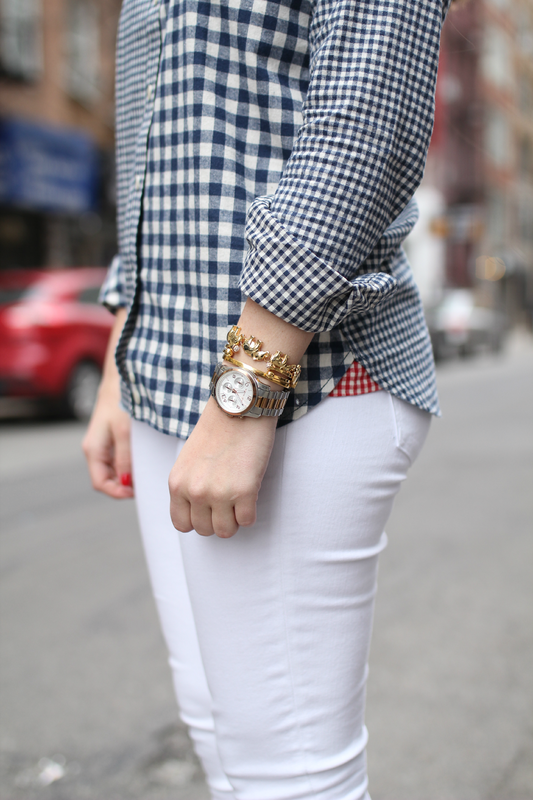 Also, more gingham. Go figure. Just got this top the other week and I love it. 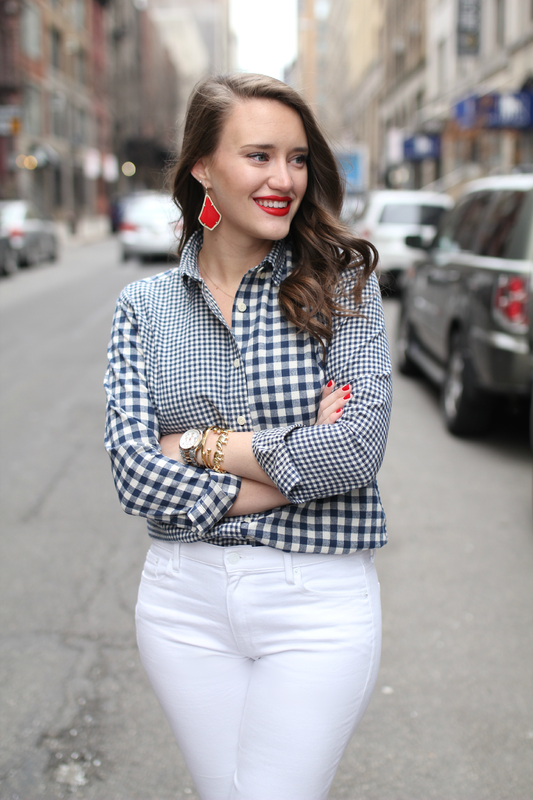 It's the perfect button down for the transition to spring and I mean it’s double gingham so you know it's already in my closet. 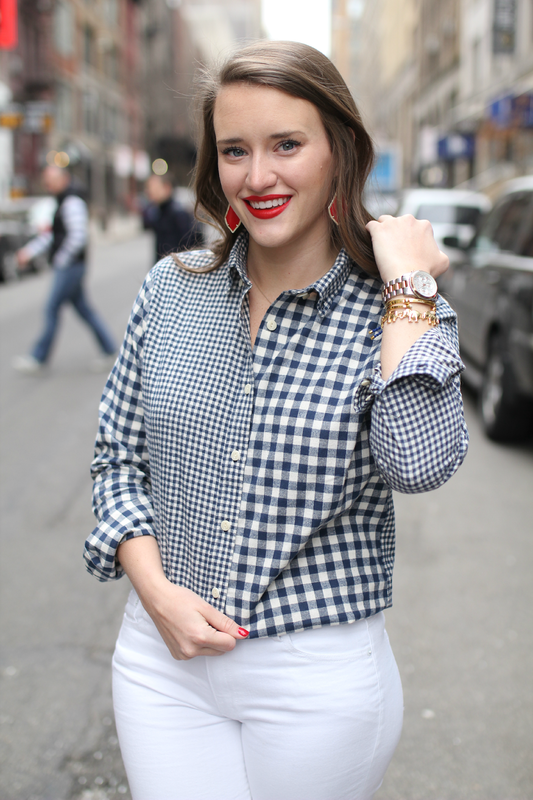 And if blue gingham doesn't tickle your fancy, they have the same shirt in red here. I’m also pretty happy to bring my lace up heels. I bought these last year and wear them all the time (they go with everything) and thankfully they brought back the same style for this season. It’s supposed to be 65 degrees today so hopefully I can start breaking out my shorts again. Are my legs even ready?! Haven’t seen them in months. What a cool shirt! Love how original it is and the mixture of big squares and small ones. Your heels are gorgeous! Haha I feel you, haven´t seen my legs in a very long time either! Lucky you to be able to think about shorts, I can´t even get rid of my boots right now. I love those earrings with your lipstick! Very cute! ps...bare legs? shorts? no way--- it's going to snow here tonight!!!! Hi Krista! I absolutely love the first picture - it is so gorgeous! Love the outfit, as well! I've been a reader for awhile and just wanted to know what type of lens you use for shooting (mm/f)? (and if you have this listed somewhere already, my apologies!). Also - I love how you work full-time and also have time for your blog - it's very inspiring! Hi Auburn! Thanks for reading :) Nice to "meet" you!